Discussion in 'Hardware' started by confusis, Mar 29, 2019. What the new Ryzen platform also offered is a chipset-less option - A300. Because Ryzen integrates so many controllers and devices into the die, it is possible to create a motherboard with no chipset at all, much like the ill-fated AM1 platform. SATA, PCIe, RAM, and more fed straight from the CPU/APU to the requisite ports on the board. Nice! Debris84, Phuncz, VegetableStu and 1 other person like this. Interesting conclusions. You said the boost clocks were the same but the results for the DeskMini were lower? That's baffling. Is there a utlity where you could record a time-usage/time-clock speed curve and see if the boost clocks are consistently held through the benchmark? I'm looking for an option there, hence the further digging. There will be a follow up article to this in the future. Great review! What is the lowest possible motherboard standoffs for this motherboard? 5mm, due to the bottom mounted M.2 slot. Thank you very much. I would be grateful if you can also specify the height of the selected elements. Thank you in advance. Could the performance be effected by different timings on the ram? Or were they the same? annasoh323 and Soul_Est like this. Is there no power consumption mentioned in the review or am I just blind? Looking at the board do you think it's easy to desolder the dc-power connector? Have a question for people regarding how PCIe lanes will work on this unit. From what I've read, the Raven Ridge chips have a dedicated 8 PCIe instead of 16 available to a PCIe GPU as well as an additional 4 lanes to the "Chipset" for NVMe etc as well as (I believe) 4 lanes for NVMe specifically. 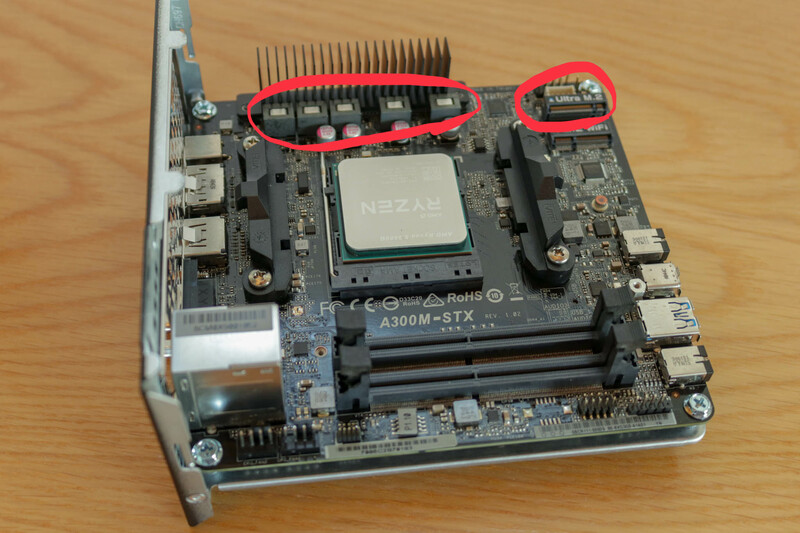 Given that the board has 2x M.2 slots, can anyone confirm that they will each have x4 of dedicated lanes, one of which would be sharing with SATA/USB etc? Cheers. Sata won’t be sharing with PCI, they are different busses, so yes you have to share some M.2 bandwidth but not from SATA, same with USB. The confusion has probably arose because PCIe is replacing Sata slowly, which will mean we will all want more PCI lanes in future. 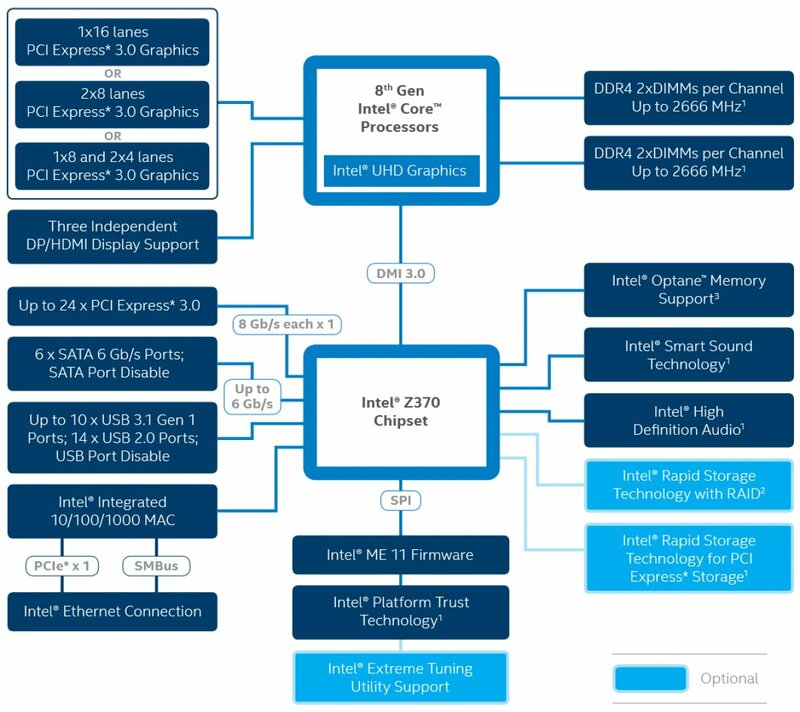 The way consumer Intel works is that they have 4 lanes of PCIe to the PCH/Chipset (denoted by DMI 3.0) which can then be virtualized to 24 PCIe lanes for M.2, SATA, etc so they actually do share PCIe lanes/bandwidth. AMD is similar, but they allow an additional x4 lanes specifically for M.2 BEFORE the chipset (B450, X370, etc.). Since A300 technically is "Chipsetless", my question revolves around how they are handling PCIe distributions for M.2. Possibilities include each M.2 slot having a dedicated x4 connection to the CPU with other things (SATA/USB) using other lanes, one M.2 having a dedicated x4 with the other M.2 sharing 4 PCIe lanes as they typically would with one of the other AMD chipsets or EVERYTHING sharing a x4 connection to the CPU. This makes a real difference if you're considering using an eGPU with this platform as in the third scenario you would lose significant bandwidth if you're using a high transfer rate NVMe drive, high throughput USB devices, etc. From that point of view I can only see it that eternal graphics will get PCIe4, leaving 4 lanes left for the other NVME? Doesn’t AMD/CPU have to grab those, despite the ‘chipless’ nature of the board- that said the few boards I’ve seen, all Chinese, seem to be a bit free and easy in how they allocate ou resources. There was a guy on You Tube today, he may help answer your question. In the article you say you allocated 3GB of DDR to video memory, I thoughtb the maximum was two|? You can put what you want but it will only use two? That stock HSF is the one currently included on the Athlon 220GE - I have one that I use in my M350 case. It was definitely using three gigabytes (on both systems) in 3dMark! Yes, you are right, I checked, before it definitely was 2GB- to the extent you could just leave it to self-manage rather than set a figure, but that seems pre-Ryzen G (2015 ish) and maybe the last of those strange Bristol Ridge chips. I also came across a lot of debate about the merits with GPU overclocking where it indicates the greater benefits to AMD in pushing the graphics cores at the expense of the CPU cores- bit over my head I’ll be honest. Thank you for the review. Is it possible to test if any linux distro would work out of the box on this machine with the ryzen 5 2400g? If possible, are there any issues with wifi or any other drivers? I know that windows is supported, just wondering if linux would work?